All the features can’t help you if you don’t have enough juice to run the device. Taking this as the keypoint ASUS launched a smartphone Zenfone Max with huge battery capacity. So today we will review the smartphone and I will tell you should you buy ASUS Zenfone Max or not. The main thing to look out for is other features as the phone will have a good battery, no doubt in that. The Zenfone Max has a good build quality with Faux leather finish back. It feels good even better than Zenfone Zoom back design. The phone is heavy weighs 202g mostly due to the huge battery. ASUS was never famous for making light slim phones. On the front it has 3 touch capacitive buttons that are again not backlighted. I don’t think they are planning to do that even in the near future. This time we have the volume rockers and the power button on the right side, the micro-USB port at the bottom with the 3.5mm jack on the top. On the back there is the camera with laser autofocus sensor and dual tone LED flash. The grip of the phone is good due to the leather finish. The back cover is removable but the battery is not. The phone boasts a 5.5-inch screen which is not at all easy to handle with one hand. The debate on the screen size will go on as it all depends on the user if it suits him/her or not. For me, I am now habitual using the 5.5-inch screen and there are some pros of having a larger screen. Though the bezels can be reduced by removing the touch capacitive buttons and providing the on-screen option only. The display is an HD display having resolution 720 x 1280 pixels with pixel density not more than 267ppi. The phone just has an average display which is not at all impressive while you look at it. I didn’t like the display quality much but it is not that bad for normal usage. Speaking about the protection which is again an important factor in any device, the phone has Gorilla Glass 4 support which will definitely try to avoid scratches. This is where the smartphone didn’t prove to be up to the mark. The ASUS Zenfone Max comes with Qualcomm MSM8916 Snapdragon 410 chipset with Quadcore processor clocked at 1.2GHz only. It has 2GB of RAM and 16 GB of storage which can be expanded using a Micro SD card. For graphics support it has Adreno 306 GPU. Enough of the numerical stats, for the real experience the phone is only good for average/normal users. High-end users must not at all go for this device. 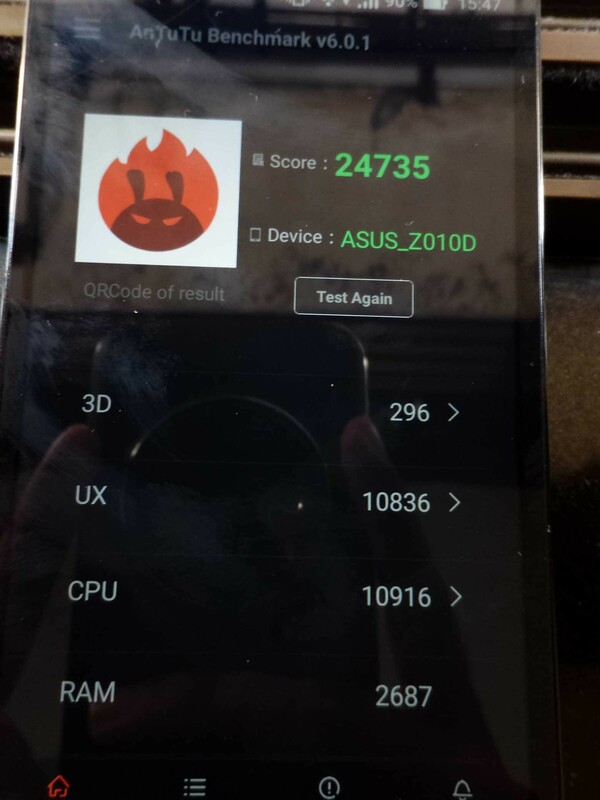 ASUS Zenfone Max will run normal apps with no issues as such, but as soon as you move on to above normal level gaming the phone starts to show issues. I was able to run Asphalt 8 but not very smoothly and high-end game like N.O.V.A. 3 failed totally. So this is a phone that can handle normal everyday task easily. I really expected a bit better from ASUS in this segment along with the powerful battery backup. I got an AnTuTu Score of 24735. For the software part, Zenfone Max comes with Android Lollipop running Zen UI on top of that. Now there are two thing that you want to know. One that the smartphone comes with many app which may prove to be useful or useless depending on the user. You can always uninstall or disable those apps but I will go ahead and call them bloatware. Second thing is the OS consumes way more battery than other apps and even Screen. They really need to work on this segment. You can go ahead and disable all apps from auto start manager to extend the battery life if you are using a Zenfone. ASUS Zenfone Zoom has a 13MP rear shooter along with 5MP camera in the front. At the back it also has laser auto focus and dual tone LED flash support. The camera performs good in adequate light conditions, but some disturbance(grainy texture) can be seen while shooting indoors. I guess this is the case with most of the Zenfone series smartphones. So always try to have good light before you go to shoot pictures with this smartphone. You can always use the low light mode but that will decrease the pixel density. Zenfone Max is able to record full HD videos at 30fps. You can experiment with different camera modes provided by ASUS according to the surrounding you are shooting in. No phone camera can beat the beautification feature of ASUS, right girls? The sound from this device has average volume level not the best for music lovers. The speaker grill is at the back placed at the bottom. The phone has a dual sim support with 4G/3G/2G on first SIM & 3G/2G on the second. Other than that the phone supports Wifi, Bluetooth, GPS & USB OTG. You can connect your pendrives/USBdrives to the phone and share the data between the two. Here comes the main feature of this phone i.e. the battery backup. 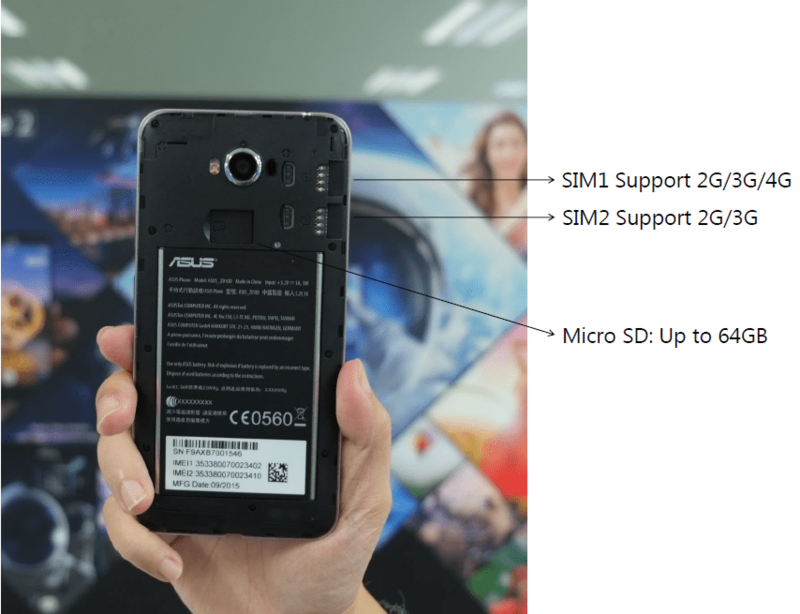 ASUS Zenfone Max has a 5000mAh huge battery pack. This will help you last for 2 days easily even more if you are a normal user. Power users can use the phone with extensive gaming and movies for one day. Moreover one of the very special feature of the phone is Reverse charging. What it means is that, you can use this as a power bank and charge your other devices too. For that you can use USB OTG cable that comes with the smartphone. I must agree that surviving 2 days without charging does bring back the golden old days. It feels good to use the screen on more than 50% brightness and still don’t have to care for low battery. I really hope that if all the phones had such good battery backup. The charger provided with this phone is not a fast charger. The charging time is approx 4 hrs for full charge. The phone is available for Rs. 9,999 on Flipkart and Amazon. It is available in two colors Osmium black(Leather like finish) & Pure white(Eggshell Finish). You get a charger, USB cable, USB OTG cable, warranty and stuff along with this phone. You also get 5GB ASUS cloud storage and 100GB Google Drive storage for 2 years. 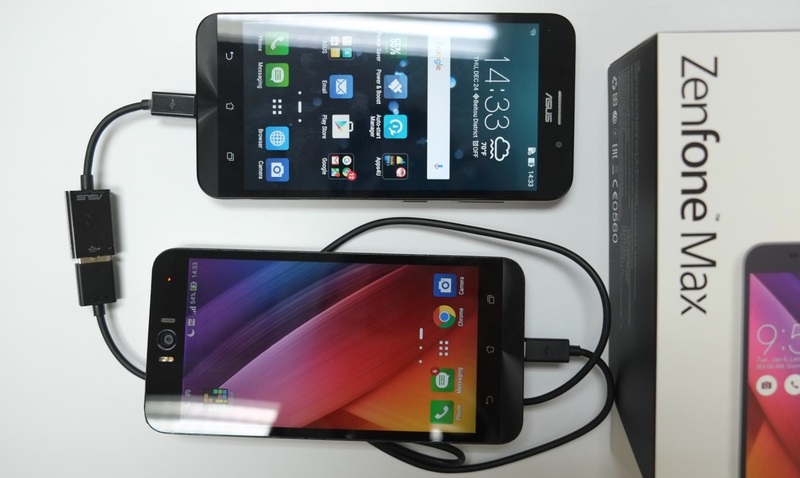 Coming to the final question should you buy ASUS Zenfone Max? It is quite simple now, the users who give more weightage to a good battery than performance must definitely go for this phone. Means the users who use normal messaging, calls, few other apps. Now for the power users and gamers I won’t recommend this device at all because, you will have all the juice in the world but the high end games won’t work. Lastly for the users who give preference to camera, I would suggest Max has a decent camera considering the price range, or you can go for other options like Mi4i. For power users I will recommend Coolpad Note 3, Le1s or other good smartphones in this price range. Again, Max lacks a fingerprint sensor too so choose wisely according to your needs.